Christendom has several meanings. In a contemporary sense it may refer to the worldwide community of Christians, adherents of Christianity; or the collectively of Christian majority countries, or countries in which Christianity dominates, or nations in which Christianity is the established religion. 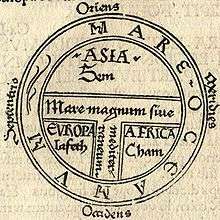 In its historical sense, the term usually refers to the medieval and early modern period, during which the Christian world represented a geopolitical power juxtaposed with both the pagan and especially the Muslim world. In the traditional Roman Catholic sense of the word, it refers to the sum total of nations in which the Catholic Church is the established religion of the state, or which have ecclesiastical concordats with the Holy See. 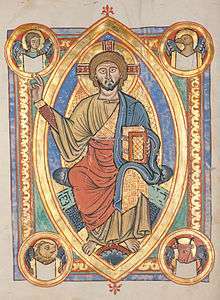 The term cristendom existed in Old English, but it had the sense now taken by Christianity (as is still the case with the cognate Dutch christendom , where it denotes mostly the religion itself, just like the German Christentum). The current sense of the word of "lands where Christianity is the dominant religion" emerges in Late Middle English (by c. 1400). This semantic development happened independently in the languages of late medieval Europe, which leads to the confusing semantics of English Christendom equalling German Christenheit, French chrétienté vs. English Christianity equalling German Christentum, French christianisme. 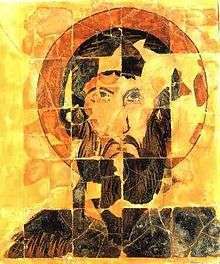 The reason is the increasing fragmentation of Western Christianity at that time both in theological and in political respect. 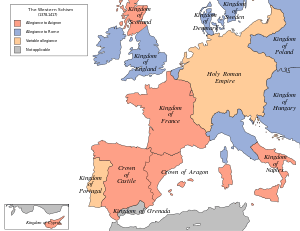 "Christendom" as a geopolitical term is thus meaningful in the context of the Middle Ages, and arguably during the European wars of religion and the Ottoman wars in Europe. The Christian world is also known collectively as the Corpus Christianum, a translated as the Christian body, meaning the community of all Christians. The Christian polity, embodying a less secular meaning, can be compatible with the idea of both a religious and a temporal body: Corpus Christianum. The Corpus Christianum can be seen as a Christian equivalent of the Muslim Ummah. The word "Christendom" is also used with its other meaning to frame-true Christianity. A more secular meaning can denote that the term Christendom refers to Christians considered as a group, the "Political Christian World", as an informal cultural hegemony that Christianity has traditionally enjoyed in the West. In its most broad term, it refers to the world's Christian majority countries, which, share little in common aside from the predominance of the faith. 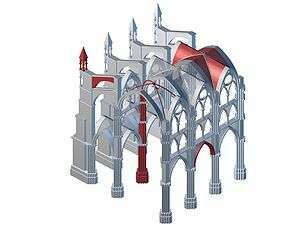 Unlike the Muslim world, which has a geo-political and cultural definition that provides a primary identifier for a large swath of the world, Christendom is more complex. It may be a cultural notion, but has very little weight in international discourse; very few political observers really discuss Christendom, while the Muslim World tends to comprise a civilization in itself. For example, the Americas and Europe are considered part of Christendom, but this region is further subdivided into the West (representing the North Atlantic) and Latin America. It is also less geographically cohesive than the Muslim world, which stretches almost continuously from North Africa to South Asia. There is a common and nonliteral sense of the word that is much like the terms Western world, known world or Free World. When Thomas F. Connolly said, "There isn't enough power in all Christendom to make that airplane what we want! ", he was simply using a figure of speech, although it is true that during the Cold War, just as the totalitarianism of the Communist Bloc presented a contrast with the liberty of the Free World, the state atheism of the Communist Bloc contrasted with religious freedom and powerful religious institutions in North America and Western Europe. "Christendom" has referred to the medieval and renaissance notion of the Christian world as a sociopolitical polity. In essence, the earliest vision of Christendom was a vision of a Christian theocracy, a government founded upon and upholding Christian values, whose institutions are spread through and over with Christian doctrine. In this period, members of the Christian clergy wield political authority. The specific relationship between the political leaders and the clergy varied but, in theory, the national and political divisions were at times subsumed under the leadership of the church as an institution. This model of church-state relations was accepted by various Church leaders and political leaders in European history. As the Western Roman Empire disintegrated into feudal kingdoms and principalities, the concept of Christendom changed as the western church became one of five patriarchal of the Pentarchy and the Christians of the Eastern Roman Empire developed. The Byzantine Empire was the last bastion of Christendom. Christendom would take a turn with the rise of the Franks, a Germanic tribe who converted to the Christian faith and entered into communion with Rome. On Christmas Day 800 AD, Pope Leo III crowned Charlemagne resulting in the creation of another Christian king beside the christian emperor in the Byzantine state. The Carolingian Empire created a definition of Christendom in juxtaposition with the Byzantine Empire, that of a distributed versus centralized culture respectively. 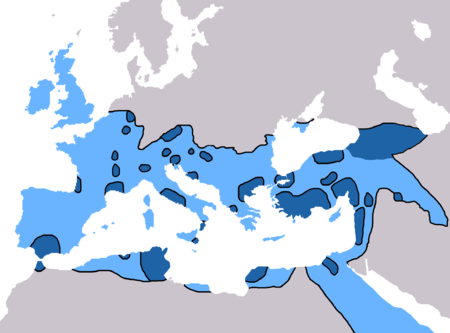 After the collapse of Charlemagne's empire, the southern remnants of the Holy Roman Empire became a collection of states loosely connected to the Holy See of Rome. Tensions between Pope Innocent III and secular rulers ran high, as the pontiff exerted control over their temporal counterparts in the west and vice versa. The pontificate of Innocent III is considered the height of temporal power of the papacy. The Corpus Christianum described the then current notion of the community of all Christians united under the Roman Catholic Church. The community was to be guided by Christian values in its politics, economics and social life. Its legal basis was the corpus iuris canonica (body of canon law). The Catholic Church's peak of authority over all European Christians and their common endeavours of the Christian community — for example, the Crusades, the fight against the Moors in the Iberian Peninsula and against the Ottomans in the Balkans — helped to develop a sense of communal identity against the obstacle of Europe's deep political divisions. But this authority was also sometimes abused, and fostered the Inquisition and anti-Jewish pogroms, to root out divergent elements and create a religiously uniform community. Ultimately, the Inquisition was done away with by order of Pope Innocent III. Map of the Western Schism: red is support for Avignon, blue for Rome. Caution: it is highly inaccurate in some regions and borders, see its Talk page. Professor Frederick J. McGinness described Rome as essential in understanding the legacy the Church and its representatives encapsulated best by The Eternal City: No other city in Europe matches Rome in its traditions, history, legacies, and influence in the Western world. Rome in the Renaissance under the papacy not only acted as guardian and transmitter of these elements stemming from the Roman Empire but also assumed the role as artificer and interpreter of its myths and meanings for the peoples of Europe from the Middle Ages to modern times... Under the patronage of the popes, whose wealth and income were exceeded only by their ambitions, the city became a cultural center for master architects, sculptors, musicians, painters, and artisans of every kind...In its myth and message, Rome had become the sacred city of the popes, the prime symbol of a triumphant Catholicism, the center of orthodox Christianity, a new Jerusalem. 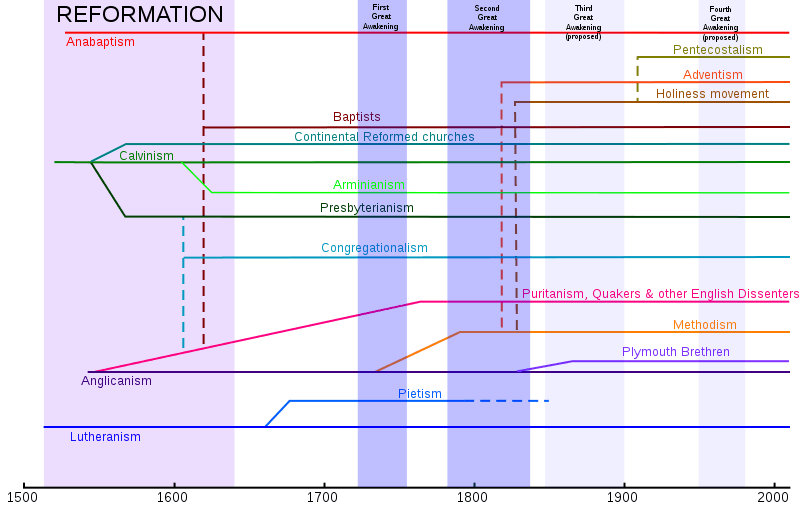 In modern history, the Reformation and rise of modernity in the early 16th century entailed a change in the Corpus Christianum. In the Holy Roman Empire, the Peace of Augsburg of 1555 officially ended the idea among secular leaders that all Christians must be united under one church. The principle of cuius regio, eius religio ("whose the region is, his religion") established the religious, political and geographic divisions of Christianity, and this was established with the Treaty of Westphalia in 1648, which legally ended the concept of a single Christian hegemony in the territories of the Holy Roman Empire, despite the Catholic Church's doctrine that it alone is the one true Church founded by Christ. Subsequently, each government determined the religion of their own state. Christians living in states where their denomination was not the established one were guaranteed the right to practice their faith in public during allotted hours and in private at their will. The European wars of religion are usually taken to have ended with the Treaty of Westphalia (1648), or arguably, including the Nine Years' War and the War of the Spanish Succession in this period, with the Treaty of Utrecht of 1713. In the 18th century, the focus shifts away from religious conflicts, either between Christian factions or against the external threat of Islam. The European Miracle, the Age of Enlightenment and the formation of the great Colonial empire together with the beginning decline of the Ottoman Empire mark the end of the geopolitical "history of Christendom". Instead the focus of western history shifts to the development of the nation-state, accompanied by increasing atheism and secularism, culminating with the French Revolution and the Napoleonic Wars at the turn of the 19th century. Christianity is the predominant religion in Europe, Russia, the Americas, Oceania, the Philippines, Eastern Indonesia, Southern Africa, Central Africa and East Africa. There are also large Christian communities in other parts of the world, such as China, India and Central Asia, where Christianity is the second-largest religion after Islam. The United States is the largest Christian country in the world by population, followed by Brazil and Mexico. The estimated number of Christians in the world ranges from 2.2 billion to 2.4 billion people. [lower-alpha 1] The faith represents approximately one-third of the world's population and is the largest religion in the world, with the three largest groups of Christians being the Catholic Church, Protestantism, and the Eastern Orthodox Church. The largest Christian denomination is the Catholic Church, with an estimated 1.2 billion adherents. Global distribution of Jewish in 2006; percentage of the top nation (Israel - 5,313,800). Although Christianity and Judaism share historical roots, these two religions diverge in fundamental ways. Though Judeo-Christian tradition emphasizes continuities and convergences between the two religions, there are many other areas in which the faiths diverge. Percentage adherents of Islam and a map of the Muslim World (2014). Christianity and Islam share their origins in the Abrahamic tradition, as well as Judaism. Islam accepts Jesus and his miracles and other aspects of Christianity as part of its faith - with some differences in interpretation, and rejects other aspects. The declaration Nostra aetate officially established inter-religious dialogue between Catholics and Hindus. It has promoted common values between religions. There are over 17.3 million Catholics in India, which represents less than 2% of the total population and is the largest Christian Church within India. Irreligion is an absence, indifference or hostility to religion. Secularism, in one sense, may assert the right to be free to choose religious beliefs and non-beliefs. 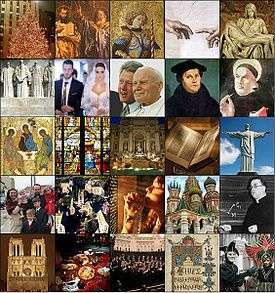 In its most prominent form, secularism is critical of religious orthodoxy and asserts that reason and the scientific method are better ways to understand reality than religious beliefs. Humanism refers to a philosophy centered on humankind. Much of Humanism's life stance upholds human reason, ethics, and justice, and rejects supernaturalism (Christian mythology). 1 2 See Merriam-Webster.com : dictionary, "Christendom"
↑ Marty, Martin (2008). The Christian World: A Global History. Random House Publishing Group. ISBN 978-1-58836-684-9. ↑ Acts 3:1; Acts 5:27–42; Acts 21:18–26; Acts 24:5; Acts 24:14; Acts 28:22; Romans 1:16; Tacitus, Annales xv 44; Josephus Antiquities xviii 3; Mortimer Chambers, The Western Experience Volume II chapter 5; The Oxford Dictionary of the Jewish Religion page 158. ↑ Walter Bauer, Greek-English Lexicon; Ignatius of Antioch Letter to the Magnesians 10, Letter to the Romans (Roberts-Donaldson tr., Lightfoot tr., Greek text). However, an edition presented on some websites, one that otherwise corresponds exactly with the Roberts-Donaldson translation, renders this passage to the interpolated inauthentic longer recension of Ignatius's letters, which does not contain the word "Christianity." ↑ Chisholm, Hugh (1911). The Encyclopedia Britannica: A Dictionary of Arts, Sciences, Literature and General Information. Encyclopedia Britannica Company. p. 700. ↑ Challand, Gérard (1994). The Art of War in World History: From Antiquity to the Nuclear Age. University of California Press. p. 25. ISBN 978-0-520-07964-9. ↑ Willis Mason West (1904). The ancient world from the earliest times to 800 A.D. ... Allyn and Bacon. p. 551. ↑ Peter Brown; Peter Robert Lamont Brown (2003). The Rise of Western Christendom: Triumph and Diversity 200-1000 AD. Wiley. p. 443. ISBN 978-0-631-22138-8. ↑ VanDeWiel, C. (1991). History of canon law. Leuven: Peeters Press. ↑ Canon law and the Christian community By Clarence Gallagher. Gregorian & Biblical BookShop, 1978. ↑ Catholic Church., Canon Law Society of America., Catholic Church., & Libreria editrice vaticana. (1998). Code of canon law, Latin-English edition: New English translation. Washington, DC: Canon Law Society of America. ↑ Mango, C. (2002). The Oxford history of Byzantium. Oxford: Oxford University Press. ↑ Angold, M. (1997). The Byzantine Empire, 1025-1204: A political history. New York: Longman. ↑ Schevill, Ferdinand (1922). The History of the Balkan Peninsula: From the Earliest Times to the Present Day. Harcourt, Brace and Company. p. 124. ↑ Schaff, Philip (1878). The history of creeds. Harper. ↑ Herbermann, Charles, ed. (1913). "Christendom". Catholic Encyclopedia. New York: Robert Appleton Company. ↑ Herbermann, Charles, ed. (1913). "Inquisition". Catholic Encyclopedia. New York: Robert Appleton Company. ↑ The Cambridge Modern History. Vol 2: The Reformation (1903). ↑ Norris, Michael (August 2007). "The Papacy during the Renaissance". The Metropolitan Museum of Art. Retrieved 11 December 2013. ↑ McGinness, Frederick (26 August 2011). "Papal Rome". Oxford Bibliographies. Retrieved 11 December 2013. ↑ Cheney, Liana (26 August 2011). "Background for Italian Renaissance". University of Massachusetts Lowell. Retrieved 11 December 2013. 1 2 Santayana, George (1982). The Life of Reason. New York: Dover Publications. Retrieved 10 December 2013. ↑ Herbermann, Charles, ed. (1913). "Symbolism". Catholic Encyclopedia. New York: Robert Appleton Company. 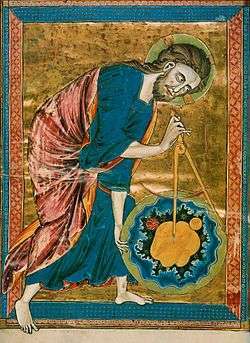 ↑ Alfred Crosby described some of this technological revolution in his The Measure of Reality : Quantification in Western Europe, 1250–1600 and other major historians of technology have also noted it. ↑ "Gov. Pataki Honors 1700th Anniversary of Armenia's Adoption of Christianity as a state religion". Aremnian National Committee of America. Retrieved 2009-04-11. ↑ "Costa Rica". Encyclopædia Britannica. Retrieved 2008-05-11. ↑ "Denmark". Encyclopædia Britannica. Retrieved 2008-05-11. ↑ "El Salvador". Encyclopædia Britannica. Retrieved 2008-05-11. ↑ "Church and State in Britain: The Church of privilege". Centre for Citizenship. Archived from the original on 2008-05-11. Retrieved 2008-05-11. ↑ "Iceland". Encyclopædia Britannica. Retrieved 2008-05-11. ↑ "Liechtenstein". U.S. Department of State. Retrieved 2008-05-11. ↑ "Malta". Encyclopædia Britannica. Retrieved 2008-05-11. ↑ "Monaco". Encyclopædia Britannica. Retrieved 2008-05-11. ↑ "Norway". Encyclopædia Britannica. Retrieved 2008-05-11. ↑ "Vatican". Encyclopædia Britannica. Retrieved 2008-05-11. ↑ "Major Religions Ranked by Size". Adherents. Retrieved 2007-12-31. ↑ "How many Roman Catholics are there in the world?". BBC News. March 14, 2013. Retrieved 2016-10-05. ↑ Herbermann, Charles, ed. (1913). "Canon law". Catholic Encyclopedia. New York: Robert Appleton Company. ↑ Burns, "Aquinas's Two Doctrines of Natural Law." ↑ These belief systems include various non-Christian life stances, world views, ideologies, philosophies, and religions. Herbermann, Charles, ed. (1913). "Union of Christendom". Catholic Encyclopedia. New York: Robert Appleton Company.